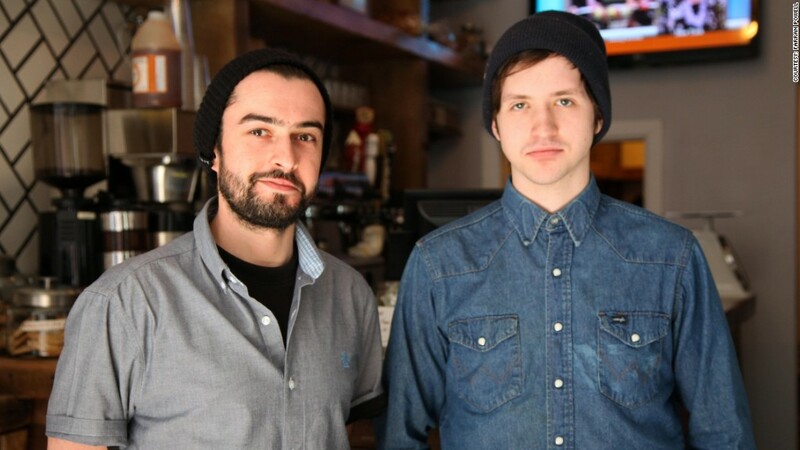 Michael Gordon and Joe Bouvier, co-managers of New York's Wash House. Nestled on a New York side street, a new type of laundromat has opened its doors, offering gourmet cheese sandwiches and drop-off laundry services. "Our coffee shop is a bar, cafe and a laundromat. It's a winning formula," said 31-year old Lee Kerzner, a native New Yorker who opened the Wash House in the East Village last month. "The response from the local community has been amazing. We're doing more laundry than we ever expected and selling out of coffee." The Wash House, the first laundromat-bistro of its kind in Manhattan, features local wood flooring and mirrors from an Upstate New York estate. It's one of several new boutique-style businesses around the country offering food and laundry under one roof. These hybrids are a contemporary spin on Duds 'n Suds, a national laundry chain popular in the '80s that featured beer and big-screen TVs. But these come with a local touch and inexpensive fine food. Sean McNeal, 38, opened the Bar of Soap in Asheville, N.C., in December 2012. McNeil drew inspiration from the Duds 'n Suds he frequented as a college student in Chapel Hill, N.C., during the mid-1990s. "There are several well-known laundromat bars around the country, and I was surprised that Asheville didn't have one," said McNeal, who worked as a wildlife firefighter before opening Bar of Soap. Asheville is known for its love of beer, and McNeal wanted a space that showcased that. Bar of Soap offers 80 different craft beers, 24 coin-operated machines, wooden seats and handmade folding tables. "Most laundromats have plastic seating and plastic tables," McNeil said. "This place is all wood, metal and handcrafted -- and there is even this beautiful maple bar that I made." McNeal spent a year looking for a space with a kitchen that would lend itself to three separate entities -- and that was located in an area with a high rental population. "You need a demographic and housing stock that lends itself to laundromats," said Jeff Zalles, who owns the well-known BrainWash, a laundromat and bistro in San Francisco that's been open since 1987. "We're a full cafe and we have live entertainment, dry cleaning and professional laundry," said Zalles. "The business sales are more 2-to-1 with the cafe and laundry." Despite the many moving parts, McNeal said having different types of services under one roof has its advantages. He operates the bar and laundromat and rents out part of the space to a local Italian restaurant, which serves inexpensive sandwiches and pizzas. "I had lots of people who wanted to rent the space, but they all wanted something fancy," McNeal said. "I wanted something a little more blue collar. I liked their pizza and it went really well with my customer base." Most of Bar of Soap's laundromat customers buy at least one beverage and around half of them order food, said McNeal. "As opposed to the other industries in Asheville, we don't have seasons," McNeal said. "The laundry is solid month-to-month, which is great in a town where people have slow seasons." Robert Cassi, a classically trained chef from Florida, strategically picked a downtown laundromat in Charleston, S.C., as the location for his gourmet sandwich shop. "I was looking for a place with high foot traffic and population density," Cassi said. "I wanted to do a menu that you would have at any full-service restaurant." Patrons at the Persimmon Café, a sit-down space at the front of the laundromat, enjoy fine food with Low Country flare, such as lump crab paninis and fresh basil limeade. "Around 10% of the laundromat customers order food or coffee at the cafe," Cassi said. Before launching their hybrid venture, the Wash House's owners had opened a coffee shop in the neighborhood so they were familiar with running a café. They spent $250,000 on the laundromat-bistro -- most of it on renovations. Later this year, they'll open a coin-operated laundry room in an adjacent space, and Kerzner said they're also planning for a location in Brooklyn. Long term, they want take the business nationally. Location will be a huge factor in expanding to other cities, and it was the main consideration for The Wash House, Kerzner said. "We scoped out the neighborhood and staked out the space for two months, watching people carrying their laundry for five or 10 blocks," Kerzner said of their search to find the perfect spot. "We felt we could open a coffee shop just about anywhere."